Back Woods catered my daughter's wedding this past weekend. I have heard nothing but great comments regarding the food. Working with Mrs. Kathy was a breeze. Thank you so much for your part in making the reception run smoothly. There are not enough words to express how happy and pleased I was with the services provided. Everyone was friendly, the set up was beautiful, and the food was delicious. Usually everyone has a food complaint but every one of my guests bragged and were asking for doggie bags. I also forgot my wedding cake set up; without missing a beat they pulled out everything I would need for my guests to enjoy my wedding cake and saved the day. Thank you so much for everything! I would recommend them for any event! They catered our banquet last weekend that had guests from all over the US and some from Japan. Everyone loved the food!!! Great job; on time; delicious; easy to work with!! Thank you so much for making our event special. HIGHLY recommend Back Woods Catering for any event. The team was as courteous as the food was delicious. Fresh food, extremely well prepared and excellent presentation. Kathy catered my husband's 60th birthday celebration. The food was delicious. There were leftovers, but not because the food wasn't eaten....there was just lots of it. Kathy and Pam did a wonderful job with the food, and they left my kitchen spotless, too! 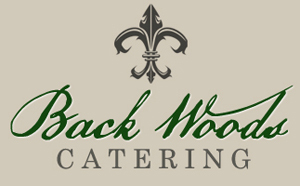 Back Woods has catered the last two major events for the Kiwanis Club of Alexandria. Whether it is the complimentary foods for a Cochon-de-lait, or the appetizers and dinner for a formal banquet, Kathy and her team have no peer in Central Louisiana. Always on time, always delicious, always ready to go the extra mile to make the entire event, not just the food, perfect. Thank you for your attention to detail and outstanding service! Back Woods Catering catered our daughters wedding this past weekend. We wanted everything to be perfect for our daughter. Because of Back woods catering it was beyond perfect. The food was absolutely delicious!!!!!!! The staff went above and beyond to accommodate us. I have nothing but great things to say about them. So a big thank you from our family to yours. These sweet people have catered our daughter's wedding reception and our son's rehearsal dinner. Delicious food and very accommodating. You will not be disappointed. I have eaten their food many times and never a complaint. I handle functions at my job and Backwoods is, by far, my favorite catering company. One never has to wonder whether the food will be good - it's always great! - and the crew is so friendly and prompt. Whether a function is on the formal side that requires service or just a drop-off luncheon, it is always perfect.